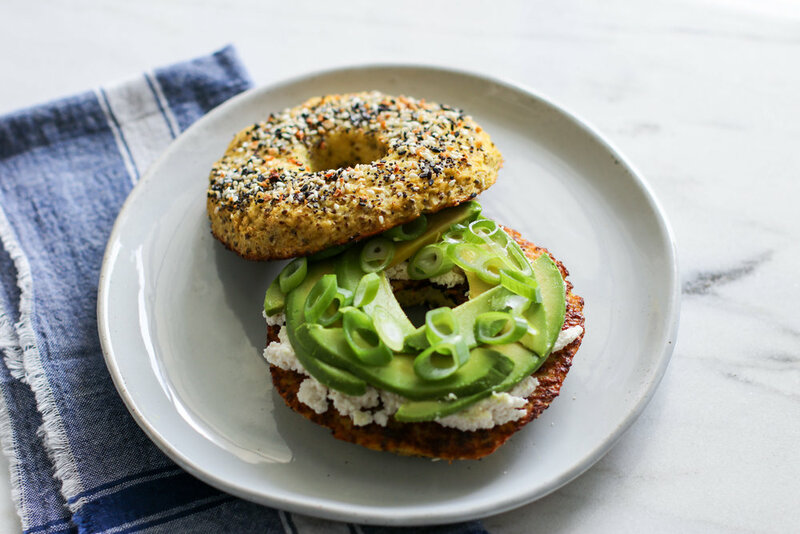 Everything Cauliflower Bagels — Erin Parekh | Live Well, Simply. As a girl who lived in Brooklyn for years, sometimes you just need a good bagel! And for me, it always has to be a loaded everything with avocado and scallion cream cheese. These Everything Cauliflower Bagels aren’t quite the real deal, but they’re equally delicious in their own right. Plus, you’re getting a serving of vegetables and avoiding that post-carb blood sugar spike that leaves us ravenous only hours after eating. Breakdown cauliflower into large florets and place in food processor with sea salt. Pulse until chopped as finely as possible. Transfer to a fine mesh strainer or a colander lined with a clean dishtowel. Let stand 30-minutes, then press and squeeze out as much water as possible. I usually end up with at least 1/2 cup liquid. Combine cauliflower mixture with eggs, chia seeds, flax meal, and nutritional yeast. Let sit 5 minutes while oven heats. Form mixture into 4 balls and flatten out onto baking sheet. Poke a hole in middle of each bagel and shape with hands. Each bagel should be roughly 1/2” thick. Brush tops with olive oil and sprinkle with everything bagel spice. Bake in 400 degree oven for 25-30 minutes until golden brown and firm. Let cool 5-10 minutes. Serve and eat! Bagels are best fresh from the oven, but will keep several days in the fridge. Reheat in the toaster oven. If you don’t have everything bagel spice, sprinkle with a mixture of flakey sea salt, sesame seeds, poppy seeds, and dried onions. For burger buns or as bread: Omit the bagel spice and cook without poking holes in the center.